Article and photos © Kerry Richardson. The Bohemian Club is a private men's club headquartered in San Francisco with a country retreat in Sonoma County. Each summer the club holds a two and one half week long gathering at the Bohemian Grove near the town of Monte Rio. Examination of club membership and guest lists from the grove encampments and observation of planes and individuals arriving at the local airport to attend the Grove reveal that the Bohemian Grove is a gathering place for many men with a business and professional interest in the construction of nuclear weapons, men whose companies make nuclear bombs and their delivery systems, and men in government whose jobs involve them with nuclear armaments. This article identifies some of these men. The data used to compile this paper covers an eight year period and is incomplete. It should not be assumed that all individuals named are present at the same time at the grove. Who speaks to whom and about what is not known to the writer. No attempt has been made to contact individuals named to confirm their attendance at the grove. Positions and titles may not be current. Several topics should be mentioned that this article does not deal with: uranium mining - the front end of the nuclear weapons industry, the health effects of radiation and the bomb, the strong historical role of the Bohemian Grove in the development of the United States' nuclear weapons program, and the extensive accusations of fraud by weapons contractors. Caspar Weinberger is a member of the club and is Secretary of Defense for Ronald Reagan who is also a member. (The President does not attend while in office.) Weinberger gave a speech at the grove in 1981 on the subject "Rearming America." Harold Brown is a club member and was Secretary of Defense for President Carter. Brown was a former Director of the Lawrence Livermore nuclear weapons laboratory. Charles Duncan in 1980 is listed as a guest of Harold Brown at the Grove. Duncan was then head of the Department of Energy, the branch of the U.S. Government that makes nuclear bombs. General Dynamics Corporation is primarily in the weapons business, building the Trident nuclear missile submarine, cruise missiles, and FB-111 bombers. 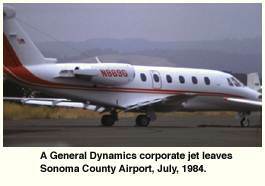 In 1982, 88 percent of General Dynamics net sales were to the U.S. Government. In 1985, General Dynamics was number two in Department of Defense contracts with $7,439,914,000 in sales. In 1982 they were number one with about $5,891,000,000. In 1979, David S. Lewis, General Dynamic's Chairman and Chief Executive Officer was listed as a guest of former General Dynamics Chairman Roger Lewis at the Grove. Their camp was Owl's Nest, one of over one hundred residence groupings inside the Grove. Owl's Nest is the camp Ronald Reagan belongs to. General Dynamics Executive Vice President and Director Lester Crown was listed as a Grove guest in 1979 also. The Crown family and their associates owned over 20 percent, more then 5,000,000 shares of General Dynamics stock according to the 1980 Corporate Data Exchange Profile. Forbes magazine in 1986 estimated the Crown family fortune as over 1.3 billion dollars. CEO David Lewis, who resigned not long ago in the wake of scandals, held more than 200,000 shares of stock. General Dynamics Director Thomas G. Ayers, former Commonwealth Edison of Chicago Chairman, was on the 1981 guest list. Rockwell International is a mainstay of the nuclear weapons industry. Robert Anderson, Chairman and CEO of Rockwell, is a club member and Rockwell Chief Financial Officer Robert A. dePalma has attended grove gatherings. Willard F. Rockwell Jr. is listed as a club member. The Rockwell family was the second largest stockholder in the company according to a 1980 Corporate Data Exchange Profile. Rockwell directors associated with the Bohemian Grove include members Fred L. Hartley, Chairman of Unocal, and Henry T. Mudd, former Chairman of Cyprus Mines, and 1981 guest J. Harrington Drake of Dun and Bradstreet. It has been written that no company benefitted more from Reagan administration policies than Rockwell International. They are the main B-1B bomber and space shuttle contractor and they work on the MX and Trident missiles. Rockwell helps operate the Department of Energy facility at Hanford, Washington that produces plutonium for nuclear weapons, and they manage the Rocky Flats Colorado facility that produces plutonium triggers for hydrogen bombs. Rockwell was number three in Department of Defense contracts with over $6,000,000,000 in fiscal 1985. General Electric was ranked number four in D.O.D. contracts with $5,890,670,000 in fiscal 1985. G.E. operates a plant in Florida that makes neutron generators for nuclear bombs. They made the reentry vehicle for the Minuteman missile. They make propulsion systems for nuclear submarines and jet aircraft engines and are involved in electronic warfare work. They are developing the engine for the Stealth bomber. General Electric Chairman John F. Welch has been listed as a Grove guest as has Edward E. Hood, G.E. 's Vice Chairman of the Board. Welch was named America's toughest boss by Fortune magazine in 1984. Club member Edmund W. Littlefield is a G.E. Director and is listed as a member of G.E. 's largest stockholding family. In addition to Welch, Hood, and Littlefield, Directors of General Electric whose names appear on lists from the Grove include member James G. Boswell II, Chairman and CEO of J.G. Boswell Co., 1980 guest Andrew Clark Sigler, Chairman and CEO of Champion International, and 1980 guest Walter B. Wriston, retired Chairman of the Board of Citicorp bank. The Boeing Company has in recent years had six members of its Board Of Directors who are listed as members of the Bohemian Club: Harold J. Haynes, retired Chairman of Chevron Corporation, Stanley Hiller Jr. of Hiller Investment Co., Rene C. McPherson, a 1986 honor winner in Fortune magazine's business hall of fame, Charles M. Piggot, CEO of Paccar Corporation that makes Peterbilt trucks, and D.E. Skinner, Skinner Corporation Chairman. Boeing Vice Chairman Malcolm T. Stamper was listed as a 1980 guest. Boeing had $5,458,404,000 of D.O.D. contracts in fiscal 1985, ranking number five. Boeing has contracts for the air launched cruise missile, the MX missile, the Minuteman missile, and has been adapting its B-52 bombers to use cruise missiles. Boeing is a subcontractor for the Stealth advanced technology bomber and is a principal contractor for Strategic Defense Initiative Star Wars. United Technologies Corporation Chairman Harry Gray, recently retired, is a frequent visitor to the Bohemian Grove. U.T. was number seven in fiscal 1985 D.O.D. contracts with about $3,905,629,000, down from their 1982 number three ranking with $4,208,000,000. United Technologies Chemical Systems Division builds rocket motors for Titan, Minuteman III, Trident, and Tomahawk cruise missiles and has a manufacturing facility near San Jose, California. U.T. makes Pratt and Whitney jet aircraft engines and Sikorsky helicopters. Alexander Haig who frequents the Bohemian Grove was President and Chief Operating Officer of United Technologies in 1980 before becoming Secretary of State, and more recently has been a consultant to the company. United Technologies Directors associated with the Bohemian Grove are member Robert H. Malott, Chairman and CEO of FMC Corporation, and 1980 guests William I. Spencer, retired President of Citicorp and Charles W. Duncan Jr., and current Citicorp Chairman and CEO John S. Reed. Westinghouse Electric Corporation Chairman Robert E. Kirby was listed as a Grove guest in 1979 and 1981. Westinghouse contracts include radar for the B-1B bomber and launch tubes for the Trident missile. They are heavily involved with nuclear propulsion systems and fuels. Westinghouse Director Roger Milliken, Chairman and CEO of the textile firm Milliken and Company, was listed as a 1981 Grove guest and Director Rene C. McPherson is a member. Tenneco Inc. Chairman and CEO James L. Ketelsen is listed as a Grove guest in 1979 and 1981. His host was D.J. Russell, a Director Emeritus of Tenneco. Club member B.F. Biaggini, retired Southern Pacific Chairman, is a Tenneco Director. Tenneco operates the Newport News Shipbuilding and Dry Dock Co. and builds nuclear submarines capable of carrying nuclear warhead armed missiles and builds Nimitz class nuclear propelled aircraft carriers. 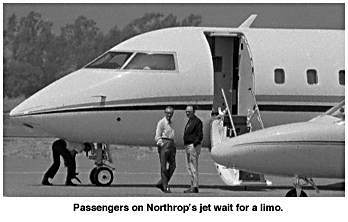 Northrop Corporation is a lead contractor on the top-secret Stealth advanced technology bomber. Costs for the Stealth program may reach 30 billion dollars. Northrop has contracts for MX missile guidance systems. Northrop Chairman of the Board and CEO Thomas V. Jones is a member of the Bohemian Club. In the summer of 1986 Jones and his wife hosted a barbecue at their Los Angeles estate for Ronald and Nancy Reagan and their friends. Northrop Director Tom Killefer, retired Chairman of the U.S. Trust Co. bank, was on the 1981 Grove guest list. TRW Corporation is a leader in Strategic Defense Initiative Star Wars contracts and was recently selected to manage the Pentagon's free electron laser experiment program. They have been researching a new method of producing weapons grade plutonium using lasers. Ruben F. Mettler, TRW Chairman and CEO was listed as a Grove guest in 1981. TRW Directors named on lists from the Grove are member Jack S. Parker, retired Vice Chairman of General Electric, and member H. Guyford Stever, a scientist and consultant. TRW is a MX missile contractor. 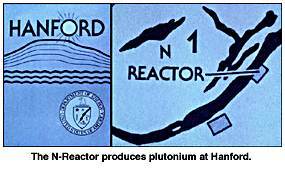 UNC Resources, formerly known as United Nuclear Corporation, is a contractor at the Department of Energy's Hanford Nuclear Facility where it operates the N-reactor to produce plutonium for nuclear bombs. The N reactor is a type similar in design to the Soviet Union's Chernobyl reactor. Former UNC Chairman James R. Bancroft is a member of the Bohemian Club. His guest at the 1980 Grove encampment was former UNC Chief Executive Officer Keith A. Cunningham. AT&T (American Telephone and Telegraph) through its Western Electric subsidiary manages the Sandia National Laboratories on a no fee no profit basis. Sandia Labs has facilities in Albuquerque New Mexico, Livermore California, and Tonopah Nevada. The Sandia Lab is involved with the design, testing, quality control, safe handling, and storage of nuclear weapons. They train military personnel on their use and maintenance and are involved with a weapon from its inception until its retirement from the stockpile. Former AT&T Chairman Charles L. Brown was on the 1979 guest list and new Chairman James E. Olson was observed en route to the Grove in 1986. AT&T Director Phillip Hawley is a club member and Directors James H. Evans, Rawleigh Warner Jr., and Joseph D. Williams are named on guest lists. Monsanto Corporation Chairman and CEO Richard J. Mahoney was observed in transit to the Bohemian Grove in 1986. Monsanto manages the Mound Facility in Miamisburg Ohio for the Department of Energy. 2,060 people were on Monsanto's payroll there in 1982. The main activity of the Mound Facility is the production and maintenance of the non-nuclear components for U.S. nuclear weapons: detonators, timers, firing sets, and test equipment. Some work with nuclear materials also occurs there. The Bechtel Company is a privately owned construction firm operating worldwide and headquartered in San Francisco and is a mainstay of the nuclear industry. S.D. Bechtel Sr.. and S.D. 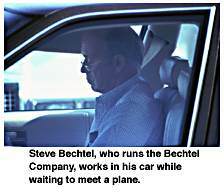 Bechtel Jr., who now runs the company, are members of the Bohemian Club. Forbes magazine in 1986 estimated the Bechtels' net worth at over 800 million dollars. The 1981-82 Bechtel Report announced that its Nuclear Fuels Operation division would pursue defense related projects. Bechtel worked on the Waste Isolation Pilot Project located in New Mexico intended for military nuclear waste. Bechtel designed the military space shuttle facility at Vandenburg Air Force Base. Hewlett Packard Corporation co-founders David Packard and William R. Hewlett are both members of the Bohemian Club. Hewlett Packard is a contractor on the B-52 bomber and the Pershing missile. In Sonoma County, the location of the Bohemian Grove, Hewlett Packard is the largest employer and the number one recipient of Department of Defense funds. Dr. Edward Teller, Associate Director emeritus of the Lawrence Livermore Laboratory, gave a speech at the grove in 1980. Teller is a physicist who played a major role in developing the hydrogen bomb and he is a leading promoter of Star Wars weaponry. The Livermore Lab is the number one recipient of Strategic Defense Initiative Star Wars research dollars. 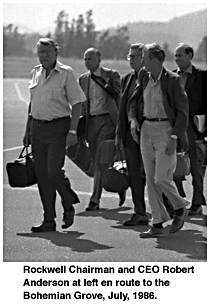 Teller and Bohemian Club member Karl R. Bendetsen and 1980 Grove guest Joseph Coors were members in 1981 of an advisory group to Ronald Reagan that received security clearances to learn about new weapons developments such as nuclear x-ray lasers. The group first met with the President in January 1982. Teller also had private meetings with Reagan before the President's March 1983 Star Wars speech. Main sources for this article include: "The Nuclear Weapons Industry" by Kenneth A. Bertsch and Linda S. Shaw, Investor Responsibility Research Center, Washington D.C.; "Star Warriors" by William J. Broad, Simon and Schuster, New York; various corporate annual reports; "1982 List of Camps and Camp Members and Key to Camp Locations 1982 Midsummer Encampment - Bohemian Grove"; Grove Guest List 1979, 1980, 1981; "FAA List of Registered Aircraft by N-number, 4/13/85"; "CDE Stock Ownership Directory", Corporate Data Exchange, Inc., New York; "Aviation Week and Space Technology, May 12, 1986". GO TO INDEX OF BOHEMIAN GROVE REPORTAGE.